Last foot treatment for this one. I see a grill in her future. That is right we invited her for dinner. If you remember we originally purchased 3 sheep. Each of these sheep were about one year old or less and have never been bred. 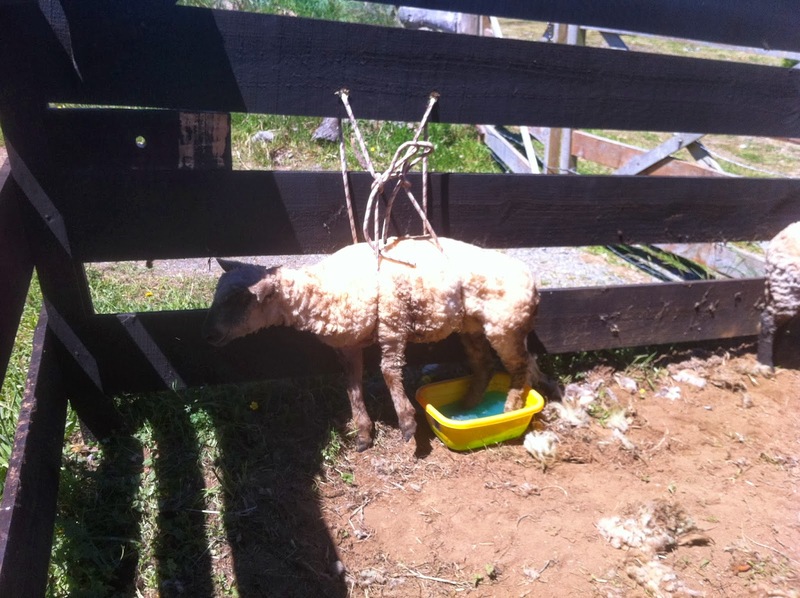 We were able to slaughter, at our friends house, the one sheep that had a bad foot. This little sheep was becoming a pain in the back, neck and everywhere else, so I put her on the grill for a nice Christmas dinner (She had it coming and we did too). Well this left me with only two sheep, 2, only two! I must say that 2 sheep is /are not a flock. It is like having only one sock, one shoe, or something. So I needed to convince Lori that we definitely need more sheep, just to be safe, and besides we could breed them and get little white, fuzzy, cute..... and yummy garlic covered with mint sauce baby lambs in December 2014. Sheep have a 5 month gestation. I planned out my attack for the convincing and sprung it on her right after she and Emily got suckered into carding, spinning, and knitting, the wool that we already in bags on the porch. It was perfect she never saw it coming. Well we purchased two more Ewes from our neighbor Christelle who has about 2,000 sheep on her farm (fundo). The sheep were second year ewes and had already been bred and had a lamb last year, so this would help when Lambing season comes as the older ewes typically do not have problems with second lambs. These sheep have had little to no human contact. Lori the Sheep Sheering Queen. Who is my love and joy. 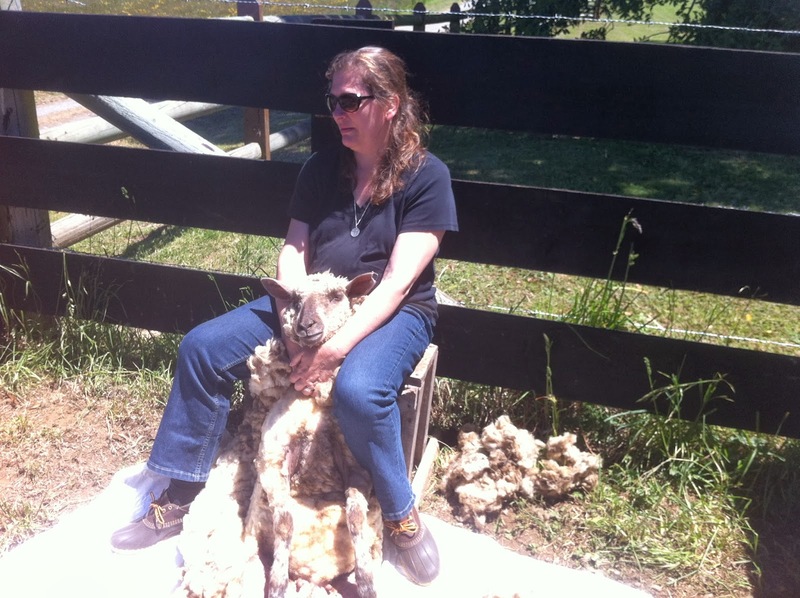 Well Christelle delivered the sheep 30 December and Lori and I got to work sheering the sheep. A Ha you say "more wool"! The sheep were real skittish and I was a little concerned so I kept them up in the paddock for a couple hours and then slowly put them with the two sheep I already had out in the yard. 15 minutes later they were back at Christelle's house! They both jumped right through the fence. One then the other. It was like greased Lamb Lighting! They were "see ya later gone". At this point it was raining buckets, the wind was howling, I mean mayhem. There was not way I was going to catch them. So I called Christelle and told here that the sheep were back home. She said she could see them in the front yard at her house and that I could come and get them in 3 days or so. Well 3 days later she called and offered me some other sheep in their place if I liked, and I did like, cause we would get two more bags of wool. Christelle did not care either way as they do not typically sheer their sheep ever, as they are mostly meat producers and have no need for the wool. So I had to devise a sheep retention plan for the new sheep, as they would surely leave as soon as they were put in the yard, just like the last ones. I consulted with some local sheep experts who suggested I put some logging chain around their necks attached to a weight, so that they have to stay in my field and can not run too fast. Also it gives them more time to become accustomed to my sheep. Look at this pesky sheep. Head high ready to run. We named her "Maaa". Here is her younger accomplice who has no name. You can not trust this one! The sheep retention system is working perfectly and they have calmed down. So we will see how long I need to keep them on the chain. I hope to halter break them both so that they come to me when I call. This will make lambing time easier also, no matter how high a fence I build they will always want to get out unless I break them to lead. Which will lead me to another blog post some time later. Lori went to Osorno to go "Deal Shopping" and here are some of the fresh deals she walked in the door with. Nuttin special tonight. We had sloppy joes, fresh blueberries, a light glass of Chilean Red wine, and some local farm cheese. We went for a swim at the lake with some friends and their grand kids. Just wonderful people and well behaved kids too. After the swim we all had some hot walnut spice cake Lori my love made.